It’s not a very well-kept secret that I strongly dislike speculating on anything from a new set. When almost every single card in every new edition is at a high price from hype alone, I’m not a huge fan of trusting competitive players’ instincts about what card will be the next Deathmist Raptor, Boros Reckoner, or Courser of Kruphix. I’ll leave figuring that puzzle out to the people who actually play this game for a living, and try to focus on the most consistent and loss-proof ways to grind value out of the game on my end. As you can tell by a majority of my articles and Twitter activity, my time and cash is usually spent buying collections and singles at buylist prices from people who need or want to liquidate their investments in the game, and then reselling those cards through outs like Facebook, TCGplayer, my display case, and Craigslist. When I do dabble in speculation, I try to minimize my risk as much as possible, even if it means waiting on a long-term investment over a number of years. That’s why instead of writing a listicle like “Top Five Origins Cards That I Think Are Undervalued!” I’m going to try and remind everyone that you don’t have to be looking for money in Origins just because it’s the hot new thing off the printing presses. Instead of trying to crack the Magic code and find the next Outpost Siege or Mastery of the Unseen, I have my sights set on targets that I think will avoid a reprinting in the long term, hold a strong new price point if and when they do spike, and are relatively cheap and easy to buy into right now without anyone else fighting over them. 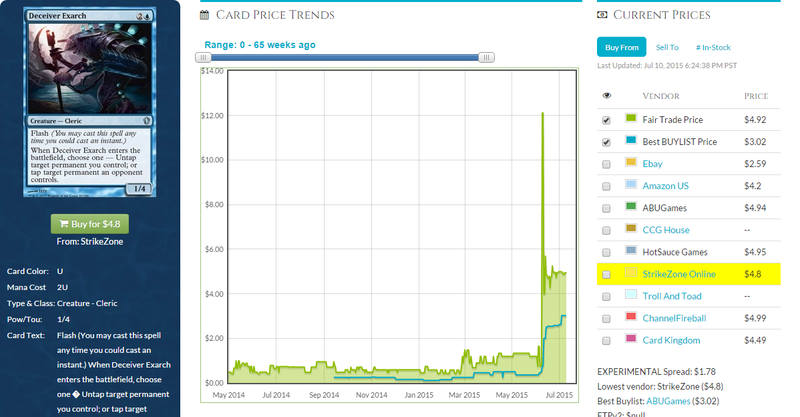 That being said, I still very rarely “buy into” cards with cash at full retail anymore, even for speculating purposes. Most of my owned stock of the following list comes from PucaTrade credit that I have stored up, picks from bulk lots that I’ve pulled for essentially free, or singles that I bought at buylist prices but didn’t want to sell at the moment because I felt that the card had a bright enough future. Now that those statements are out of the way, let’s get to the list of cards that I think you should have your eye on instead of Origins, especially if you’re not exactly a Standard player. Yes, one of them is a common and the other is an uncommon. Glistener Elf also got thrown its own Event Deck printing and FNM promo, so I’m not entirely sure if the ceiling on this is equal to good, old Exarch. However, I pull these constantly from collections, and the buylist outs are only ranging between 20 and 35 cents. That just doesn’t feel right for a four-of staple in a competitive Modern archetype that was from a set like New Phyrexia. Every time I pull these, I simply set them aside, and I’m willing to wait the required months before we start seeing this as a $2 common that the Modern format has come to accept as a normality. While I don’t think there’s any rush to go buy out the internet before they spike tomorrow (as you can see, I tweeted the above over a month ago and have seen next to zero gains), it’s something that I would get in on sooner rather than later if you plan on playing the deck, and something I would hold back on buylisting for now if you’re comfortable with waiting into the long term for larger rewards. Apparently my memory wasn’t entirely accurate in the tweet, since Phyrexian Unlife originally jumped to only $3.00 from 30 cents—so only a 1,000-percent increase instead of what I had originally remembered from a year ago. Something else I remember from a year ago is everyone calling Amulet of Vigor an inconsistent cheese deck that was just a simple flash in the pan. The deck was cheap and easy to build at the time, and Amulet itself had already jumped once. Another New Phyrexia card highlighting the awesome mechanic that is infect, and I can’t see it being printed again until Modern Masters 2017. Is Ad Nauseam going to take Twin’s place as the throne holder of the most popular combo deck in Modern? No, probably not. However, Living End didn’t have to put a bunch of copies into the top eight of a Grand Prix to convince the world that it needed to be a $13 in the past couple of weeks. It had a severe case of “being a Modern-legal rare with zero reprints and seeing play in a deck,” which caused it to jump. It’s also the cornerstone of one of the cheapest decks you can build in the format, with the most expensive card being a $15 common that we all know and love (Serum Visions, for those who were scratching their heads). You can purchase the entire deck for less than three copies of Tarmogoyf, and that’s certainly going to be an attractive dealbreaker for new players looking to enter the Modern format on a budget. 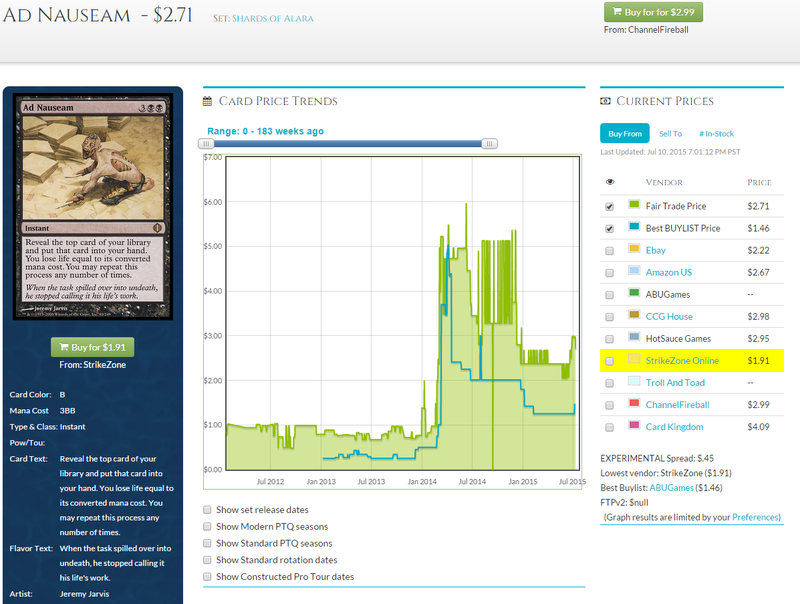 While there are still 100 to 200 sellers of each combo piece on TCGplayer, and I don’t expect a buyout within the next few weeks, I don’t think these two cards are safe from jumping up with sudden demand. If the deck starts to see even a glimmer of a consistent competitive showing or a banned list announcement shakes up the format with the coming of Battle for Zendikar, I want to be the one holding these cards months in advance to sell into any future hype. One of the last cards I want to talk about this week is Shelldock Isle. But DJ! You just listed three niche Modern cards that have already seen competitive play and haven’t spiked yet. 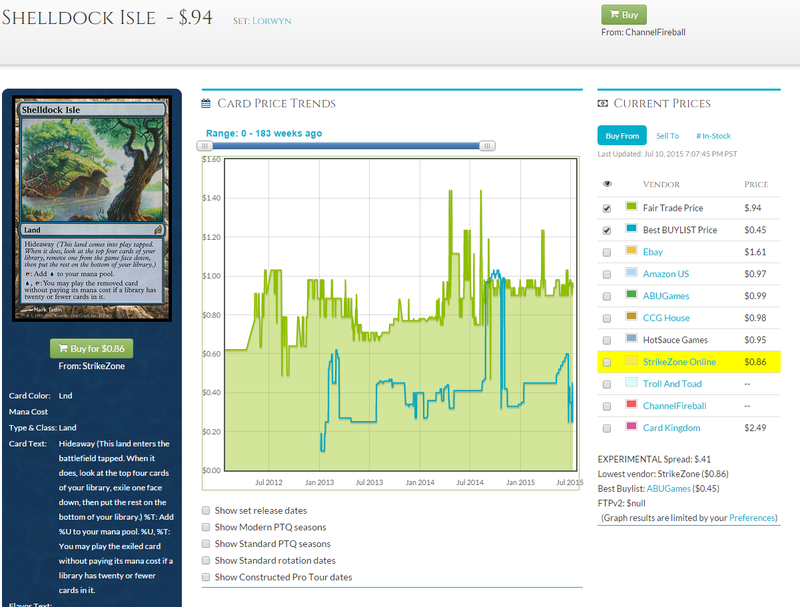 Is there some sort of amazing Shelldock Isle deck that’s going to spike the next Modern Grand Prix? How many hundreds of copies should I buy? Well, don’t get your hopes up. I don’t exactly know what deck is going to play this. Maybe it spikes eventually due to some crazy Modern deck, and maybe it slowly creeps up over time because casual players are infatuated with the idea of reducing an opponent’s library to zero cards. Either way, we have a utility land with no reprints, a weird mechanic, casual appeal, and theoretical competitive appeal. If someone told you a year ago that Nourishing Shoal would be a $10 card, you would have called them an idiot. I would have called them something less mean than idiot, but still would’ve given them a stern talking to about their life choices that had led up to that pronouncement. However, Magic: The Gathering players proved us both wrong, came up with a silly combo deck that uses a bulk rare from Kamigawa, and ta-da! $10 card overnight. And Shoal doesn’t even have an ounce of appeal to EDH or casual players, or a weird mechanic that would prevent it from being reprinted in another set in the future. If you’re still tapping your foot and waiting for an example of where I actually made money off of this strategy (I wasn’t one of the people holding onto dozens of Nourishing Shoals when they became relevant), then I ask you to look at another card in the Ad Nauseam deck that recently came to fruition. 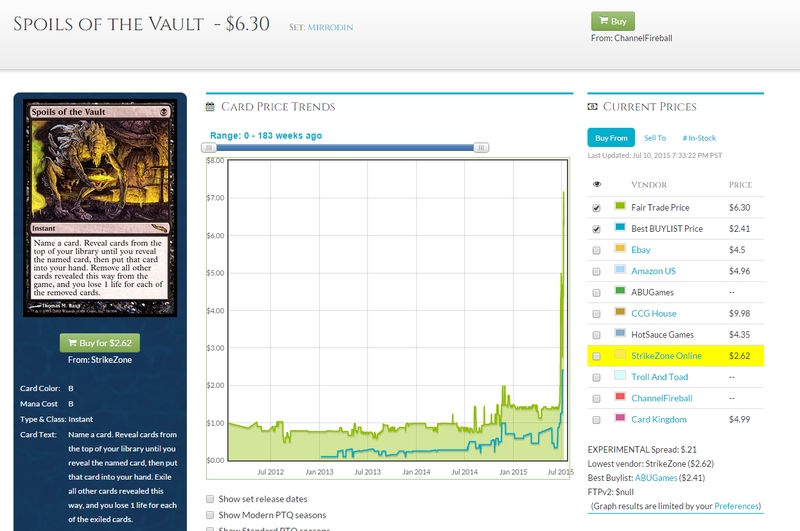 Spoils of the Vault was, up until quite recently, a near-bulk rare. Every now and again when I bought collections, I would pull these out of the pile of bulk rares that I picked up at a dime a piece, and throw them into my spec box. “Maybe one day…” I would think longingly. Ad Nauseam didn’t have to win an event for Spoils to give me my spoils, and it certainly won’t have to for either of its other friends in the deck to see a bump. While Spoils was printed approximately sixteen-thousand years before New Phyrexia or Shards of Alara, I still don’t think we’ve seen the last of this deck rearing its’ head in the finance market. Maybe you’re a Standard grinder and you found this article completely useless. You bought into Thopter Spy Network and funneled your entire Swiss bank savings into it, and now you feel like an evil genius because you just unloaded your four-hundredth copy for $3 after you bought in at $1. Why jump in on Shelldock Isle, which will take several months (optimistically), if you have a hawkeye for what’s going to be playable in the first few weeks of Standard? Well, I don’t have a counterargument for that. If you’re good enough at predicting the Standard metagame and you have the ability to move a lot of cards as soon as you get them in, then you have no reason to cross your fingers on the long haul like I’m doing with the above cards. It makes a lot more sense for you to pinpoint the exact card in each new set that everyone else considers to be best for kindling a dumpster fire and haul in your profits on the Tasigur of the new set. If it works for you, there’s no reason to quit now. Good luck, and I’ll see you next week! We should talk on Skype before next week. 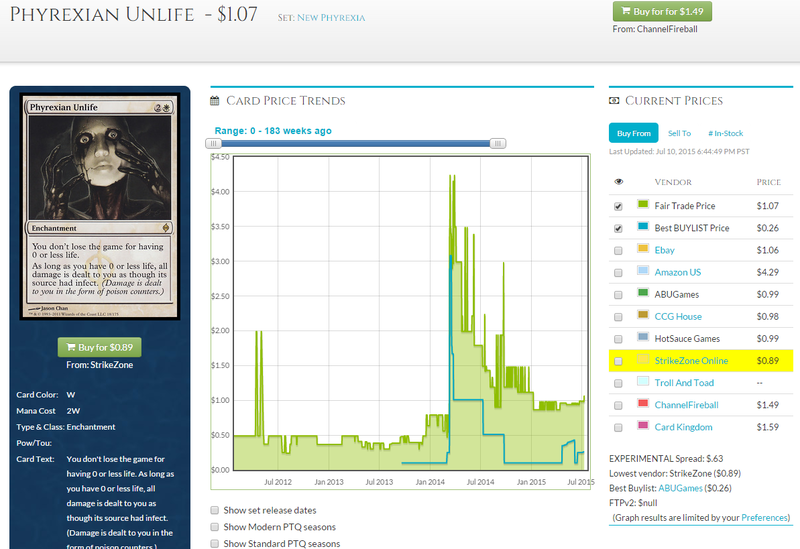 There’s a lot more going on if Phyrexian Unlife spikes again that you may not have considered. I’d write about it but it’s not really where my series is headed. We should talk before you write your next article. I enjoyed this article. Nice to see you thinking aloud about your process and choices. This is a really insightful piece, with some solid, actionable ideas. I picked up a couple Ad Nauseams when I saw you tweet about it. But I think perhaps I need to go spend a few more bucks here and there to gain some exposure to these other ideas. All very solid. Just a heads up on maybe why Nourishing Shoal is superspiked, it does have a weird mechanic that makes it reprint proof. You might need to check the type line to find it though. Modern masters has no problem doing arcane. So Shoal is not reprint proof.